Every tradesman is familiar with cable routing and the risks of splinters with some cable rods. That became a painful reality for Jason Price of Jason Price Electrical Services, whose hand was badly injured last year when a cable rod by another supplier splintered during use. Thanks to C.K, Jason became the proud owner of a C.K MightyRods Pro cable rod set, which offers total protection against splinters due to a unique SplinterShield coating. 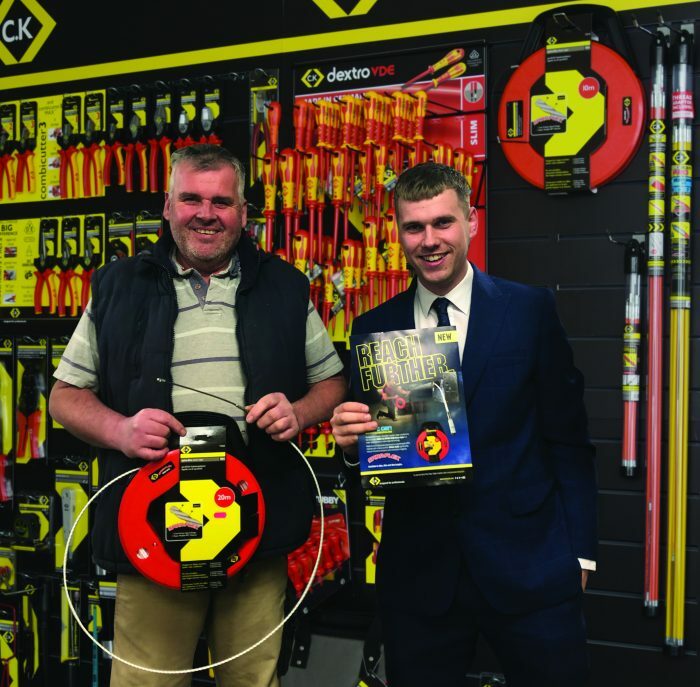 Will Sheridan from C.K originally heard Jason’s story during a visit to wholesaler, Seryn Electrical and, by chance, recently met him again during another visit. Jason is still suffering intense pain in his injured hand and an operation to remove the splinter has proved unsuccessful, leaving the splinter embedded and resulting in ongoing pain. On a lighter note, Will took the opportunity to present a delighted Jason with C.K’s SpiraFlex rod, to help make his work that much easier. Working with professional tradesmen helps C.K find solutions to end user needs and enables C.K Tools to develop the most advanced cable routing products. The C.K MightyRods Pro are specifically designed to combat the issues of painful splintering and snapping, thanks to an innovative SplinterShield coating – Europe’s first splinter-proof material – that protects the rods and allows both safe and efficient working conditions. C.K realised that flexibility is also key to successful cable routing and introduced its super-flexible Spira-Flex rod, which is perfect for accessing tight corners, bends and other obstacles. The SpiraFlex draw tapes offer fantastic benefits when it comes to hassle-free cable routing. The super flexible and immensely tough 4mm Ø SpiraFlex draw tape offers a major improvement on standard nylon and steel draw tapes, which are often prone to twisting and kinking. The latest introduction – the C.K Gloworm Cable Router – adds another dimension to the range and is perfectly designed for running cables around tight corners, through insulation filled walls, underneath flooring and across ceilings. Gloworm’s clever glow in the dark phosphorescent polymer construction, aids routing in low light conditions and easier navigation towards exit points. When charged under natural light, Gloworm provides an effective glow for up to 30 minutes.